Discussion enhances the learning impact of every Seeing Math™ Secondary course while also fostering collaboration and building community. 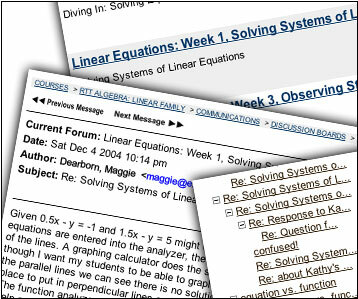 Through moderated web-based discussion forums, Seeing Math™ Secondary encourages participating teachers to share and discuss questions, observations, and experiences as they relate to the topic of study. Facilitators moderate discussions from the side, channeling contributions to key learning points and ensuring a thoughtful, probing dialogue. Program materials—video segments, math challenges and readings, examples from curricula—serve as the foundation for grounded discussion and reflection that is instrumental to enriching their practices and improving student learning. Discussion creates a shared learning experience that not only helps participants enhance their own knowledge and practices, but also connects key learning points to the needs and objectives of their schools or districts. By establishing a forum in which teachers share ideas and best practices for teaching math, Seeing Math™ Secondary builds a collaborative environment focused on continuous learning and improvement that lasts long after participants complete the program.